For the curious man, how to tie a turban may be one of those fashion queries that has occasionally flittered through his head. Whether you simply want to learn more about this traditional garment or wish to teach yourself how to wear one, you'll glean plenty of information here. Worn primarily by individuals from the Middle East and Southeast Asia, the turban is a traditional cloth wrapped around the head. They're worn for a number of reasons. Some cultures require that hair be covered, so the turban meets a particular need. Others wear them as fashion accessories or to keep a bare head warm if hair has been lost due to chemotherapy or other reasons. Turbans usually measure around five meters in length and are made from various materials, ranging from uncomplicated muslin cloth to complexly embroidered ethnic silks. They are also available in a wide selection of colors and prints. In some parts of the world, such as Rajasthan in India, cool colors are worn in the heat and warm shades during monsoon season. And highly decorative turbans in multitudes of colors or adornments are favored for special occasions, such as weddings or cultural festivals. 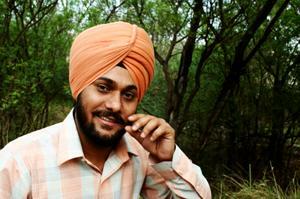 There are a variety of ways to tie a turban, and often the region where the wearer is from determines the method used. In fact, certain turban wrapping techniques may even be used to identify a wearer's social status or religion. As mentioned, there are many ways to tie turbans, since individuals of specific regions favor certain styles. Some are complicated, others are easier, but none are without their complexities. Give yourself time to really learn the basics, practice with the help of a friend or relative and don't be afraid to seek help from someone who wears turbans regularly. This is really the best way to understand this fine art! If you're ready to start, try this method, a simpler approach that will set you on the right path. Begin by folding the cloth in half, and repeat folding it in half until it is roughly five inches thick. Then fold the long strip of cloth in half so you end with one long, horizontal, thick strip. Place one end of the cloth at the nape of the neck, just slightly to the right. Hold it taut as you bring the other end to the front, crossing it slightly so it grazes your forehead at an angle. Wrap it around the other side of the head and pass it over the end at the nape of your neck (which will help secure this end). Before you continue, take a moment to straighten out any creases that may have developed in the cloth as you wrapped; also take care to ensure that the material is snug to your head and relatively tight as you continue wrapping. When you're ready, fold the longer end in half again, creating a new, thicker end to work with. Wrap it over the previous layer, continuing to fold as you go along. Begin to place the wrap slightly lower on the right side and extending it up to the left so that you create a symmetrical finish on both sides. You may find the final stretch of cloth is quite long. If so, fold it inwards so that the outer layer is the only section visible. Tuck it in and secure it tightly. You may be left with a bare spot on top, which can easily be covered with the very first layer that you wrapped at the beginning. To do this, simply reach for the layer closest to the top of your head; it will clearly be beneath the other layers but will also be quite simple to grasp. Pull it out, open it completely and tuck the end in so that it covers the visible area.